My four-year-old son and I read this book one afternoon cuddled up on the living room couch. My son is not bossy or rude, but he really enjoyed how the characters misbehaved in this book. In fact, he asked me to read it to him repeatedly. 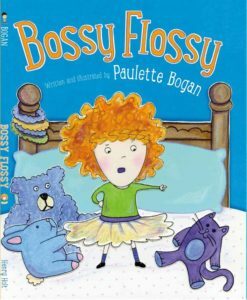 The main character in the book Bossy Flossy is quite rude to everyone she knows. She tells her mother, teacher and friends what to do and how to act and feels quite disgruntled when they fail to heed her words. In fact, she is a bit flippant when she is punished for bossing others around. My son never behaves in this manner, so I was surprised by how much he enjoyed reading about characters that boss each other around. This might be a good book for a child who is bossy, but I’m not sure what message it might give to a child who is not. I suppose it is a good way to introduce the subject to him in case he meets a friend in school or on the playground who is acting similarly. If you have a child with behavioral issues, most specifically one that is bossy, then this book might be a perfect way to create an open forum to discuss these problems. I can imagine talking about the characters, their actions and ultimately how they come together to change their behaviors. In the end, there are two bossy characters, which would also teach children that they are not alone in their actions and ultimately these two characters need each other to change their ways.